Quilts For Sale Made by American Quilters! Beautiful American Quilts For Sale! The QuiltBroker has been your first choice for buying traditional patchwork and contemporary quilts made by individual and independent American quilters since 1997. Quilts are made to be used, enjoyed, and handed down from one generation to the next! We sell one-of-a-kind', hand and machine made quilts, designed and created by American quilt makers. Some of our quilters are artisans, quilt designers or teach quilting; others are professional quilters and many are also grandmothers and great-grandmothers. 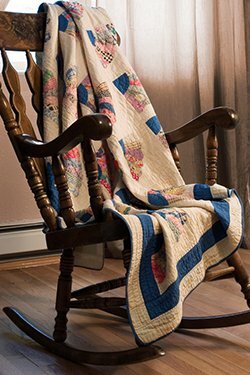 An American quilt is a thing of beauty, a work of art, a useful and thoughtful one-of-a-kind individually crafted gift, and just plain comfortable and cozy for taking that nap on your sofa or in your easy chair. Cotton Quilts are comfortable because they breathe, keeping you just right for sleeping any time of the year. Quilts can also be beautifully displayed as wall hangings to brighten anywhere they are seen, in your home or in a public setting. Our accomplished quilt makers are in keeping with the finest traditions of American quilting since the first English and Dutch settlers arrived from Europe. The earliest quilts of the colonists were an integral part of their everyday lives, providing warm covers for beds, and hung over the windows to keep out the cold. Early American Quilts were primarily utilitarian; today they are both utilitarian and creative works of art to be used and enjoyed for their beauty. The American quilting tradition of making utilitarian bed and nap quilts continues. Our mothers, grandmothers, great-grandmothers, and other previous generations have enjoyed quilting throughout American history. The ART of Quilt Making is an exercise in patience and a labor of love resulting in a useful, enduring, thing of beauty and work of art. When you buy a quilt from The QuiltBroker.com you (or a gift recipient) will promptly receive the quilt, from the individual quilter, plus any information the quilt maker cares to share with the buyer about the design and making of each quilt sold. Please let us know if your purchase is a gift for someone else, and we'll include a gift card that the quilt you purchased, for someone special, is a gift from you! Buying a quilt from The QuiltBroker.com is a very personal and rewarding experience. Our quilts are works by fine artisan quilt makers, quilt designers, professional machine quilters, and accomplished seamstress, who specialize in quilt making. Many of our quilts are unique original designs. Several of our quilters design quilts professionally and also teach quilting. Quilting is more than a hobby - it's a passion, made with love, with untold hours invested in making each quilt. It takes great patience and perseverance to finish a quilt. Quilts are very special gifts appropriate for weddings, baby showers, birthdays, graduation, anniversaries, corporate and executive gifts, holiday gifts, or just that perfect touch to finish the interior design of your home. Quilts are created to be used, and to last, with many becoming family heirlooms to be passed down through generations in your family. QuiltBroker.com quilts are typically one-of-a-kind and some of our baby and children's quilts also include a small "tooth fairy" or "critter" pillow, matching the quilt, much to the delight of a child who receives that fun quilt as a gift. American made quilts are typically washable, unlike many of the imported quilts which require dry cleaning. We also have information about how to care for your fine quilts, plus information on how to store quilts. What is the best size for a quilt? Well, that depends on how you plan to use it, and the size of you bed if using it as a throw or coverlet. Some quilts can be used either lengthwise or width-wise; other quilts cannot. It depends upon the design of the quilt. Quilt sizes can be flexible because they are not just blankets. Quilts are decorative pieces of art that can also serve the very practical purpose as bed coverings. If it is a sofa quilt, or lap-throw quilt, the size is less important. Throw quilts for beds (sometimes folded at the foot of the bed as a decorative accent piece, or used for naps) can vary in size to suit your needs. If the quilt is to be used as a coverlet, it needs a drop (from top edge of the bed to cover the mattress by a few inches) on the two sides, plus the foot of the bed, if there is no foot board. Quilts do not need to tuck-in at the foot of the bed, and coverlets do not cover the pillows. Pillows sit on top of the quilt. Use pillow shams or solid color pillow cases for pillows on top of the quilt, to compliment the colors in the quilt. Coverlet size quilts are often used with solid color dust ruffles, which can be purchased commercially, to cover the box springs and bed frame. Bed throw-size quilts are sometimes used on top of another light weight blanket, and therefore do not need to have as long a drop on sides/foot. We do ship quilts to Hawaii, Alaska, Canada, Mexico, and overseas, but additional shipping charges will apply, for which you will be billed separately and additionally. Payment of all foreign duty and taxes are the responsibility of the recipient, and if quilt is a 'gift' to be sent overseas, the buyer will need to contact the recipient, in advance, to alert them that a package will be arriving via Customs, in countries where applicable.